How and why do carbocations rearrange? Professors love to torture, err.. I mean "test" students with exam questions that involve carbocation rearrangements. It can be confusing to know how to spot what will happen in these reactions, but there's some basic principles that will have you migrating the right hydrides and alkyl groups in no time! Did you spot that one of these structures is stabilized by resonance? 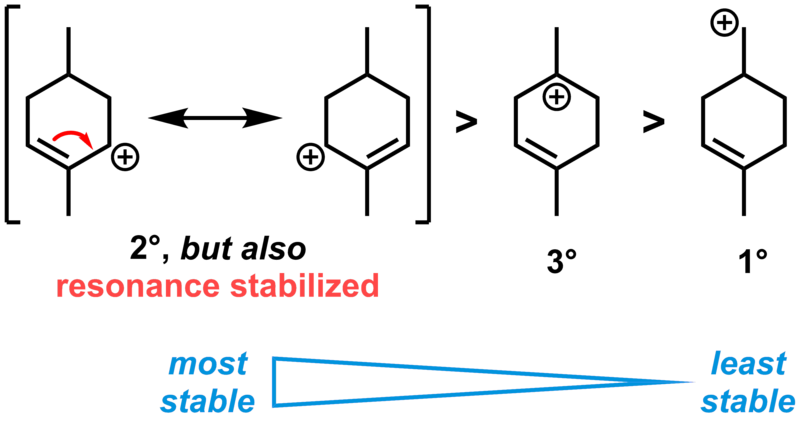 The most stable carbocation is allylic, and this resonance stabilization is more important than whether the carbons bearing the positive charge are primary (1°), secondary (2°) or tertiary (3°). Which brings us to the topic of the day. Why do both reactions below give the same product, despite using different alcohol reagents (A and B)? Carbocations! Alcohol A gives a reasonably stable, 3° carbocation, which reacts with the electron-rich benzene ring in a Friedel–Crafts alkylation to give the product. However, alcohol B gives a less stable, 2° carbocation - at least initially! 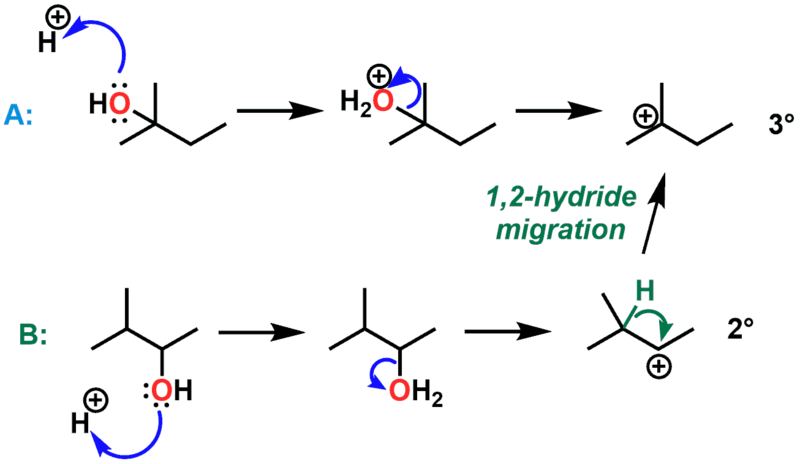 Now, if you look at one of the carbon atoms next-door - a hydrogen can migrate with its pair of electrons - hydride migration - leaving behind a more stable 3° carbocation. And, as if by magic, it gives the same carbocation that was formed from alcohol A! 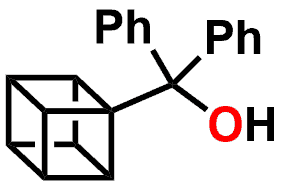 These kinds of carbocation rearrangements are also called Wagner–Meerwein rearrangements. In the short video below, I talk through some of the key concepts. Well, that's all fine and good, but how do you tackle a question about carbocation rearrangements on an exam?! My next post will be a step-by-step how-to guide to solving these type of carbocation rearrangement problems in an exam. However, before you move on, lets take a quick look carbocation rearrangements of strained rings. Here's an interesting molecule for you - a "cubane"! 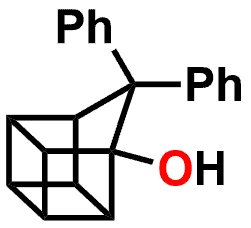 The particular cubane shown below is very sensitive, and rearranges to a "homocubane" when exposed to even very mild acid. How do you think this might occur? The key here is that carbocations can also rearrange to release ring strain. In this case, one of the 4-membered rings in the cubane expands to a less-strained 5-membered ring. It's a good idea, when tackling questions like this, to number the atoms in the starting material and see where they might have ended up in the product. A good trick to use is to always draw the ugly version first. In other words, draw the atoms in the product in the same positions as the substrate, but showing the new bonding arrangement. Your atom numbering should have helped make sure you have the right atoms connected to each other. Then, redraw the molecule in a more realistic, aesthetically-pleasing orientation. Finally, have a play with the 3D models below of the cubane substrate and the homocubane product. They’re interactive – you can rotate, pan around and zoom in/out! Given that sp3-hybridized carbons want to make 109.5° bond angles, can’t you just feel the strain in the cubane, with all those 90° bond angles! Compare that with the product, where some that strain has been released in formation of the 5-membered ring and its closer to ideal bond angles.